Founded 21 January, 2005 - To bring together people in the local area who share for Clive Staples Lewis a special admiration and an active interest. Feb. 2019: God in the Dock - cont'd. 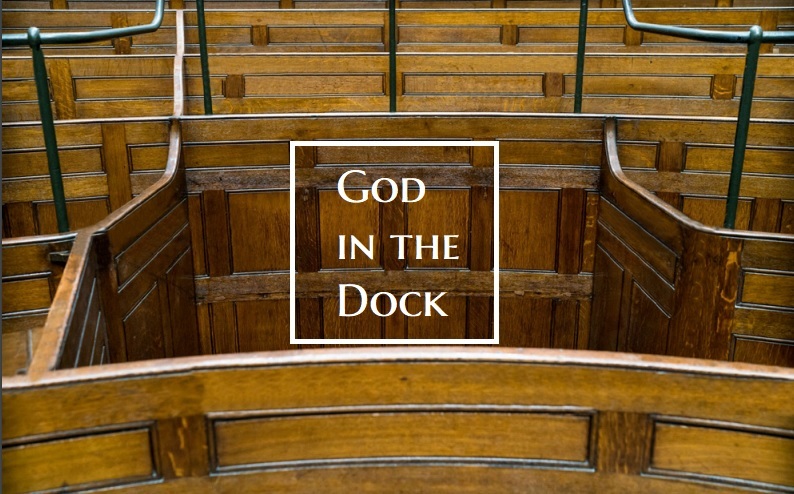 Our next meeting will see the continuation of our discussion of God in the Dock. We'll try a new venue this time: Anglican Church of the Redeemer, 104 McBrien Road, in Brainerd, 7:00-8:00 p.m. on Thursday, the 21st of February. We'll have coffee and tea for you. The church is located between Brainerd Road and North Access, very near the Moore Rd./I-24 exit. We'll see how we like it. For more info on the church you can go here. The reading will consist of Part II, chapters 15 & 16; and Part III, chapter 1, on "Bulverism." If you don't have the reading done ahead of time, you can attend anyway. The event page on our Facebook Group is found here. Thursdays are preferred by many of you for a meeting, so this month we will meet Thursday evening, the 13th, at the Spot again. I would push it out to the 20th, but that's getting pretty close to Christmas. 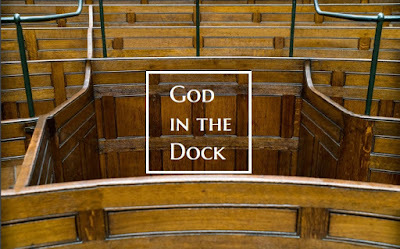 We will discuss God in the Dock, Part II, chapters 11-14. Hope you can make it! The Spot, 1800 E Main St, Chattanooga, TN 37404. It's time for another meeting, folks! Being November, we've got to work around Thanksgiving. I think it would be best if we met after than before. Let's say the Monday after Thanksgiving, 26 Nov., 7:00-8:00 p.m., at The Spot, 1800 E Main St, Chattanooga, 37404; that's at Main and Hawthorne in Highland Park. I'll be sure to reserve a larger table this time. Discussion: God in the Dock, Part II, chapters 7-9, and 10 (on Modern Bible translations) if we can get to it. See you there! You will need to go to my YouTube channel to get to the links I mention that will be listed below the video - scroll down to SHOW MORE and click on those words to see it. Cheers! All of England was amazed at what Winston Churchill called "a miracle of deliverance" at Dunkirk. People claimed it was an answer to prayer. 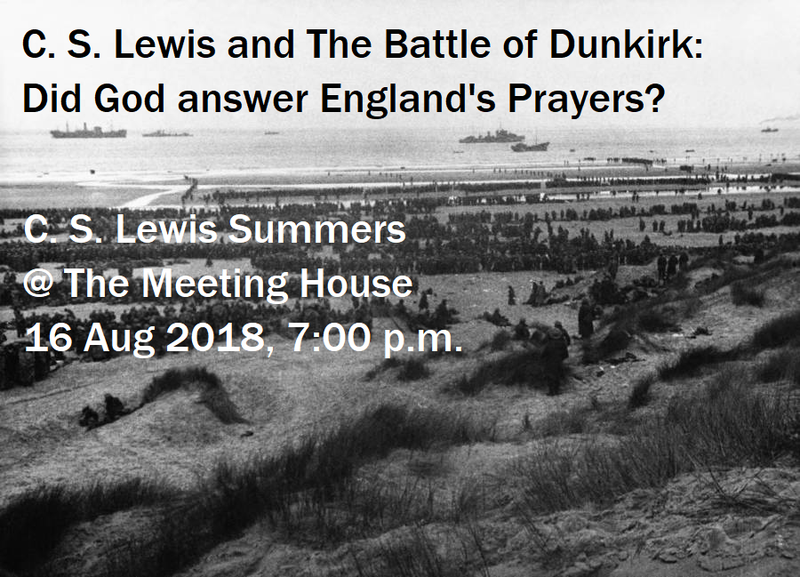 Lewis takes the occasion to comment on Christian prayer as it related to the events of history - do our prayers matter? Thursday, 16 Aug., 7:00 p.m.; arrive a little earlier if you want an espresso drink - the coffee bar will be open around 6:30. $5 entry fee - helps us to hold these events. Cllick on the photo above for a link to the Facebook Event page. The Meeting House is located at 3912 Dayton Blvd, Chattanooga, Tennessee 37415. 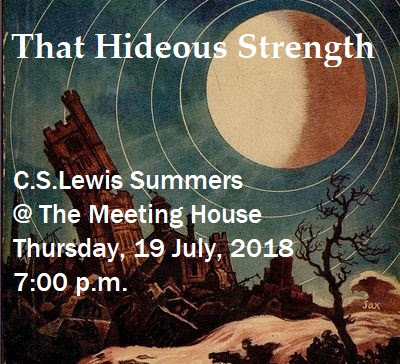 Topic: "C. S. Lewis’s That Hideous Strength and Supernatural Science Fiction"
Synopsis: This talk will consider C. S. Lewis’s science fiction, focusing on the last book of his Space Trilogy, That Hideous Strength. As a reader of H. G. Wells, Jules Verne, and other science fiction writers, Lewis creates a striking contribution to this sort of “fantastic fiction” (as he puts it). Noting some of the key features of That Hideous Strength including its medieval and Arthurian elements and depictions of the supernatural, we will consider the distinctiveness of Lewis’s science fiction. The Meeting House is located at 3912 Dayton Blvd, Chattanooga, Tennessee 37415; we begin at 7:00 p.m. and end 8:00-ish. Lecture with Q&A. You don't have to have read the book to attend. $5.00 entry at the door - helps us have these lectures. The coffee shop will be open! No expressos during the lecture :-). No need to rush off afterwards; doors close at 9:00. Click here for our Facebook Event page. You will have to turn up the sound - sorry about that! 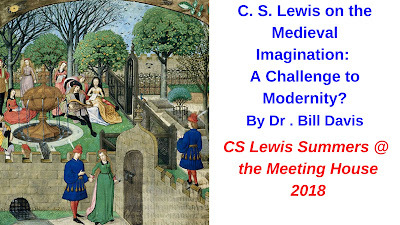 The topic of our June, 2018, meeting is "C. S. Lewis on the Medieval Imagination: A Challenge to Modernity?" The speaker will be Dr. Bill Davis. Dr. Davis is on the faculty in the department of Philosophy, Covenant College. Synopsis: In The Discarded Image, C.S. Lewis both describes and recommends the "model" that medieval authors took for granted. He offers it as essential background for appreciating medieval literature, giving a rich account of a way of imagining human existence (its place in the cosmos, freedom, significance, and purpose) that is very different from ours today. This talk will focus on aspects of the medieval model/imaginary that have been eclipsed, as well as joining with Lewis to ask whether we should lament what has been lost. The Meeting House is located at 3912 Dayton Blvd, Chattanooga, Tennessee 37415. The meeting will begin at 7:00 p.m. The coffee shop will be open. $5.00 admission at the door, thank you. Click on the image above for a link to the Facebook event page. Be sure to join us on Facebook! Greetings, gentle reader. Welcome to the website of our Society. 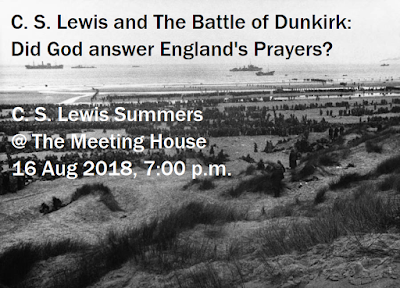 Here you will not only be able to keep up-to-date on our events, but we also provide other matters of interest related to Lewis for you as well. For information, please contact The Rev. David Beckmann, our Moderator. We have no formal membership and the public is invited to all our events. Send to Rev. Beckmann your e-mail address if you want to be on our e-mail list. Link to several old podcasts - nothing new in a while - sorry! Oops! You've hit the bottom of our front page! For the rest of our posts, be sure to look at the section above, on the right hand side, titled "Blog Archive."